I’ve been a Daily News reader all my life, but with the price going up to $1.50, I decided to give the app a try again. It’s not bad, but it has issues when using older devices (iPad 1, iPad 4). It won’t work with the original iPad, and it crashes constantly on the iPad 4 - but they’re no longer supported by Apple, so it’s not a shock. But it crashes on my iPhone 6+, so I guess that it’s a RAM issue, since it seems stable on my iPhone 7+ and iPad Pro. You don’t get the Sunday supplements or Sunday funnies, but for the price you can’t complain. The daily funnies are in very low resolution. I’m not sure if it’s an anti-piracy measure or if it’s a bandwith saving thing, but it’s tough to read them. September 9, 2018 update is bad. The update provided on 9-10-2018 is causing my IPad to shut the paper automatically when reading a page. Not sure if it is my iPad but it happens to all 3 pads in my home. This should of been caught prior to the rollout. Is anyone having trouble with the app since the latest update around Sept. 1st? The app keeps crashing on me during reading and I have to keep reloading at least 10 times to g through MOST of the paper. Getting very fustrated. Can't even email the Daily News because it keeps on crashing. Would like to know if it's just me! I’m currently paying for the digital services, but not able to download any papers because it’s not allowing me; for some reason the daily news digital service stop work. So either fix or return my money, thank you. Daily News has gone to crap!! Daily News has become so bias, it doesn’t even try to report new acutely. All I can stand is the sports stats. Mike Lupica has lost his way to liberal bias. My father worked for The News for 35 years, it was always in my house growing up. It has become just total garbage. Every day, with every disrespectful headline against the President of The United States, it gets closer to the National Inquirer and The Star. It breaks my heart to see where my father’s Daily News has sunk. Will not be renewing. Every couple of months there's an issue. Then when you call the Daily News they tell you the " the app guy isn't in yet ". Always an issue, and the people that answer the phone at Daily News sound like you're asking them about nuclear physics when you mention an app. Absolutely clueless. That h ave no business being in the app business . 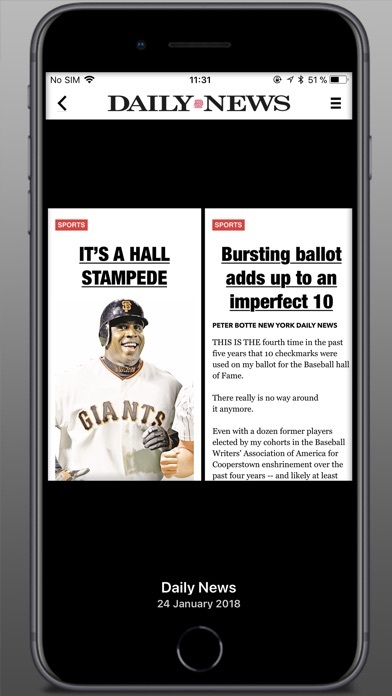 This is a great app if you want to read the newspaper a day late. They seem to only make the paper available when they feel like it. Subscribed Wednesday and was impressed with app and quality of digital paper on Wed. & Thurs. Today, Friday, latest edition is still Thursday’s. No paper today? No longer impressed. I think that the previous version was much better then the current one. I have it time to get use to it before rating it and I can truly say that I can not stand this version. If I could go back to the previous version, I would do so in an instant. Why bother having this app anymore when you cut your staff by 50 percent. Put index back in...change back to the old obituaries...change the person who writes horoscope (they're terrible) & add Sunday comics...please...thank you! I've been reading the paper since 1958. When I started reading it, it sold for 5 cents. The sports section is tops and I enjoy the main section as it usually gets right to the point. I miss the centerfold, it always was a high point. Lately you've been leaning a bit to the left. I'd prefer you simply report and let us decide. Overall I feel it's a great representative of NYC and the stories its people generate. Keep up the good work. Please, please fire the developer of this new format. Preferred the old format...more current and easier to access. What happened to the photo gallery that used to be present each day with this app? Please bring it back. NY Daily News MY Daily Habit! Couldn’t end the day without reading the Daily News’ scoops. Thank you NYDN! NONE OF THE ARTICLES ARE LOADING FULLY...THEY ARE ALL CUT OFF...HELLO?!? HOW LONG DOES IT TAKE TO IRON THIS OUT? The Daly news has turned into a liberal rag. It’s disgraceful and insulting how this paper writes negatively about the president of the United States Donald Trump. The American people voted him in and that should he respected. He is doing exactly what he said he would do. He’s cleaning this country up. America first. God bless our country. The Daily News has become a sad excuse for journalism. Only good thing about the Daily News is the comics. Not thrilled with the update that only allows you to read the first sentence of article. Why did you stop with the free news. Has some glitches where it crashes, and occasionally the days paper does not load. When app is working, best app available. It is the reason why I bought an iPad. The editions are only there when someone feels like putting them there. Yesterday’s paper wasn’t available to download until about 10 pm and today’s wasn’t available until about 10 am. It’s great when the paper is there but when it’s not, especially on days I commute, I end up buying a physical paper. No surprise the app is horrible and has recently been made worse. 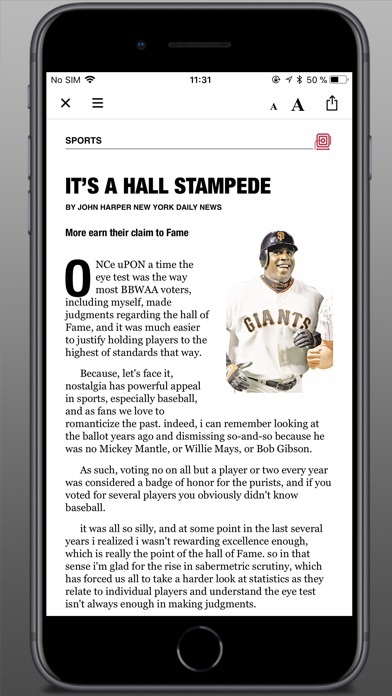 NYPost app is ideal - this one should be retired like the paper itself. Love the virtual print edition! So easy to page through the virtual print edition. TV listings, box scores, pictures and graphics, just like the actual print edition. Fantastic on ipad! No clicking, just a relaxing page through. Seeing the whole page in front of you is so different from a list of click choices. Horrible app. The last version was way better. Too many clicks to go to each article when all you had to do before is swipe. They must really want u to pay for the app because there are ads (the SAME ads) after EVERY Paragraph. Beyond annoying. Good so now that they finally decided to fix the 2 month old bug of content not updating, now the content will not fully load. The articles get cut off after a few sentences and you have to copy and paste the headline into safari to read the rest of the god dam article. Jesus f ing crist already! Why would anyone pay to subscribe to this liberal rag. I can download the paper without any problem. There is also an option to view articles with 3/page with a headline & picture with about 10 pages that is usually updated as news breaks but only 2 pages have been updated for several weeks. I notified them via the “contact us” stamp in settings, but have received no response. Also deleted, then restored the app with no change. I’ve had this app for a couple of years, but I’m not getting what I paid for now and will probably get rid of it. Too bad, I will miss it! I really hate this new version. Too difficult to scan for articles. For some reason, the app is no longer updating all stories. The first few are updated while the vast majority are weeks (months) old. Not at all useful at this time. A while ago this app was great, but now only the 1st two pages refresh. All the other pages have old content. That needs to be worked on. The last 3 Daily News covers as shown on the Daily News app are BOGUS !!! DELETED !!! Great app if you don’t mind reading month-old news stories. Reviews here are highly suspect. Stories haven’t been updating for weeks. I will not give you current news. Not enough news feed. Old news feed continues to appear on page. Only get about 4 new news feeds every few hrs. Dont know what happen to this app. Only the first two pages have new stories-the remaining pages are from weeks ago. I emailed them to let them know-I thought it was just me but I see other people are experiencing the same thing. Have uninstalled and reinstalled and yet the problem remains. Over the Last few weeks the app stopped showing new stories past the two pages. As I continue to swipe left the stories continue to be the same stories from weeks ago. “Redskins cheerleaders being sexually exploited and harassed.” “Giants better strike a deal with OBJ.” “Heather Zervos subpoenas Apprentice transcripts.” I don’t know what happened but the app has stopped refreshing content past the first 4 stories. The rest of the content seems stuck and the app appears broken. News media is dying and journalism is losing a platform further still. Is something wrong? Updating is spotty. Stories in line up are old by today’s standards. I purchased the paper. I bought it as a way to gain access to the web site. The website does not recognize that I have a NY Daily News subscription. I have tried contacting the NY DN via an email and attempted to call. I have tried for a week. Obviously, the paper is not interested in my business so I will terminate my account. This is a shame cause I really enjoy the paper/website. All other newspapers can take a lesson on app design here. No other newspaper app offers a digital edition like this. I'm lucky to get the front page of The NY Times (and why isn't that on their phone app). Echoing others - only you can decide if the content is for you, but the price of entry is fair. This app deserves to have a ton of users. This app is awful! Reading the web-based version is far superior to the app. The content is update less frequently and is therefore not as timely. It is an epic disappointment. Should have bought the digital subscription instead. Just crap. Helps immensely to keep up with news from home. Love the app and paper but many typos that bunch words together. Hope they are working on fix. The New York Daily News knows what is right. The New York Daily News knows what is right. I may not always agree with some of its political positions or its occasional entertainment crassness, but when it comes to the reality of gun violence, the NRA, #MeToo, city hall or NY State political shenanigans and the deleterious effects of Republican policies and president Trump’s craziness on our precious democracy and nation, the News reports it honestly and forcefully. In addition, its cover page is always worthy of my posting it on Facebook as is the art of its political cartoonist, Bramhall, who is brilliant and the best. Unable to log in via the app, emailed the daily news and was told the problem was fixed. When I tried to login via the app, the same happened. Emailed again and no response. My login works ok via the internet. This paper is a poor excuse for the Onion. Just wish they would have more content rather than just putting in a finite amount of stories. Can’t seem to find a search function either. This thing is constantly crashing! Fix this thing! It constantly crashes! It's a rag but I still subscribe - I love my local news and the Daily News has a local flavor. Print is big enough to read and makes picking up the local paper obsolete. I have not had issues with the app crashing but it is impossible to delete past issues and regain storage without deleting/re-installing the app. In order to earn a five star rating that needs to be fixed. App is easy to use. I enjoy it in between my Friday and Sunday delivery. I love it! I live in Idaho so I can't get the hard copy of it but this will easily do. Thank you Daily News! The only issue that I have with this app is that the text is so tiny. It's difficult to read. I live on west coast and love the style of your articles. Calling an idiot an idiot is refreshing. Only negative person seems to be a journalist slanted on turning isolated incidents into political racist rantings. I agree changes need to be made but negative breeds negative. Can he really be that racist in his writings with such little hope for improved relations? His opinions are interesting and cause people to look inside themselves, but not every person is out to hurt others. Full view of the paper. And it's the full paper because I compared a few to the print version. I also like the fact that you can go back several days if you need to download an earlier paper. Execution of this app is perfect. I love the daily news. Have been a loyal reader for more than fifty years! About a week ago it started crashing on my iPad right after opening it. Yeah I restarted, deleted app, signed out now I can't sign in bc it crashes so quickly. Sometimes it seems to get stuck midway through the paper & you’re unable to turn the page. Crashes when I open it. When I relocated my business to Manhattan in 2013, I decided to subscribe to the local newspaper, and I tried out both the Daily News and the New York Times. The Daily News is better, for many reasons. First of all, a Daily News digital subscription is $3 per month, versus $15 for the New York Times. Yet despite charging five times the price, the Times is full of annoying banner ads (literally every 4 paragraphs) whereas the Daily News digital version is ad free. If I’m paying to subscribe to something, there shouldn’t be ads in it; imagine how angry Netflix and Spotify subscribers would be if their videos or song tracks were full of annoying ads. These people at the Times have the audacity to charge people for something and still fill it with annoying advertising. 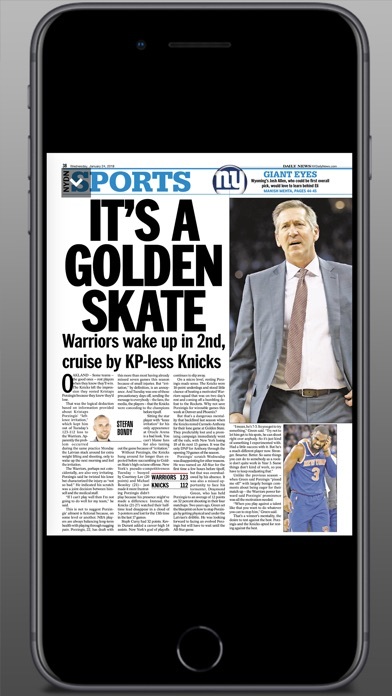 The Daily News is formatted like a daily iBook; once it’s downloaded, you can read it without an internet connection. With the Times, you need to be online to read it. Daily News’ format also lets you scroll through each day’s new edition and go back and read a day that you missed. With the Times, sometimes you’ll pick it up and there’ll be nothing new in that section, or you won’t be sure how much you missed from last time. I feel like this difference in format makes the Times lazy such that they don’t write as much news. 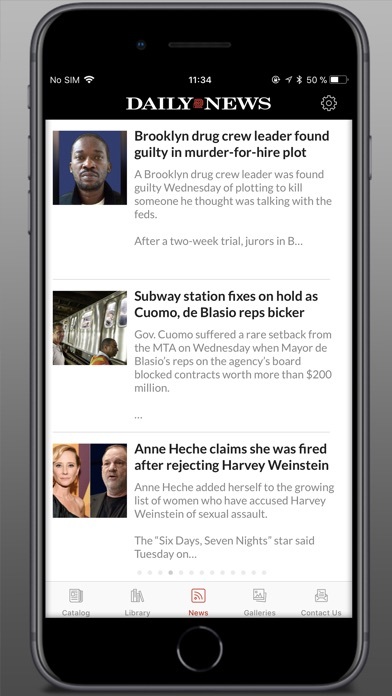 Daily News puts out 50+ pages of new content every day; I feel like the Times isn’t producing that much, at least on their app. I’d swipe through it at times and it would still be mostly the same articles from yesterday. 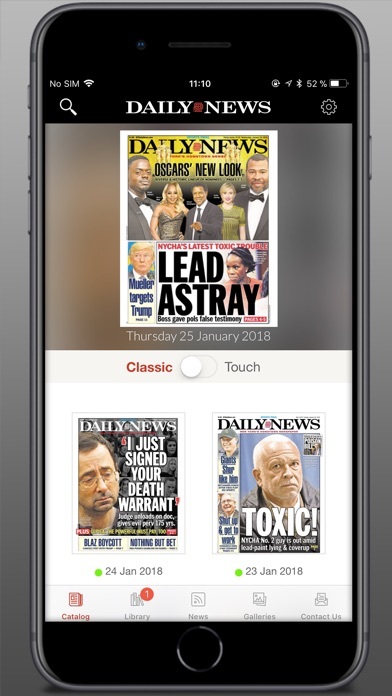 Daily News also comes with the option to download the “classic” version (basically an exact replica of the print edition) where you can read cartoons and other traditional newspaper content. There are ads in that version, but they’re still not annoyingly inserted between the paragraphs. I like that Daily News is one of the few truly non-partisan news sources; when it comes to politicians, they’re equal opportunity bashers, and their reporting is hilarious. Meanwhile, the Times barely touched on the recent mayor DeBlasio bribery scandal since apparently their fellow Democrats can do no wrong. Of course, Daily News will bash Republicans too, as seen is their famous cover stories like the Newt Gingrich “Crybaby” cartoon or the Statue of Liberty giving Ted Cruz the middle finger. I generally like this humorous and sassy tone of the Daily News; for example, on Friday they wrote “[a] former Merchant Marine Academy worker was to three years in prison for taking a boatload of bribes.” The Daily News is also more in touch with what people want to hear about; the Times is full of snooty self-absorbed narcissists. One of the sections of the Times app was “Times Insider” where they basically talked about themselves; other sections were titled “Paul Krugman’s blog” and Nicholas Kristof’s blog.” So basically, they think we should pay $15 a month to read some dude’s blog. The Times rambles and rants about lofty academic social justice warrior topics and “white privilege” that people don’t care about, instead of the things a local paper should be focusing on - things like a bribery scandal involving the mayor of their city. So to sum it up, Daily News > New York Times. The Daily News is a great newspaper that I look forward to downloading on my iPad in the morning. It’s a shame what this publication has become. Wire service articles, a ghost town for a sport department, no business articles (but plenty of gossip news!) They’ve done a great job destroying what used to be a great daily publication. Sad to say, I read another daily publication on my iPad rather than the Daily News. Up until recently the app was great but now the app cuts off by itself. It is really difficult to read the paper when the app cuts off and closes all on it's own every 30 to 45 seconds. Please fix this problem. Cancelled paper delivery when they laid off 90% of sports writers. We’re getting $35 a month from me. Run AP stories. Cheap cheap cheap. They (Tronc)Bought paper (company)for a Dollar. One Dollar!! Cheap. I Got 8 weeks digital for $1. Now you can get 12 weeks for $0 Their cheapness is loosing readers and they’re being forced to give paper away. For the past month, the app constantly crashes. I’m lucky if it goes more then five minutes before it crashes. Sent an email and got the usual response. Delete and reinstall. Still hasn’t fixed the problem. The most inconsistent news app ever. However their anti President of the United States rants are appalling.